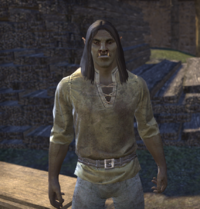 Murgonak is an Orc carpenter who can be found at his store, Woodworking Wonders, in Vivec City. If spoken to, he will say, "My workshop is your workshop—just don't break anything and make sure you put everything back when you're finished. ", "As an Orc living in Dark Elf territory, life isn't a bowl of dried tubers, but it isn't too terrible. At least, no one's tried to bind me in chains or kill me yet. There's always tomorrow, though, so who knows? ", or "Working with wood isn't quite the same as working with stone or metal, but hey, it's a living." This page was last modified on 7 January 2018, at 20:10.